St Ives Times and Echo - our local newspaper - has a wonderful weekly feature that I look forward to every Friday - Last Week's Weather. All very interesting - but it occurred to me that weather forecast would be more useful to readers. 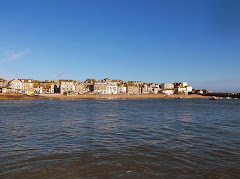 So to demonstrate that St Ives Cornwall Blog aims to meet the needs of its followers here's one - it should update automatically via the BBC Met. Office feed so bookmark it if you want to see the latest. I've been looking for some more good and reliable weather feeds to embed in my OneStIves website - so if you know of any let me know.